For more than 45 years we are constantly providing the best investment opportunities in prime locations and updating our database, as we strive to satisfy the specific needs of each and every individual customer. 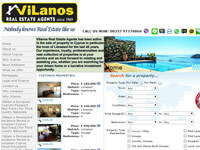 Throughout the years Vilanos Real Estate Agents Ltd has gained the invaluable experience, expertise and professionalism needed to face the increasing competition and the constant changing of times. To provide Trust, Security, Quality, Location, and Price to our customers had always been company's philosophy and those 5 parameters remain our priority. With offices based in Limassol and many partners throughout the island - Vilanos Real Estate Agents will exceed the expectations and requirements of the most demanding and discerning customer. Our experienced associates are at your service and look forward to assisting you with your investment.